Solvang, California, February 24, 2017 – A favorite time of year for the Judith Hale Gallery, located in Solvang Antiques, is the presentation of the annual Spring Art Show. A champagne reception with the artists will be held on Saturday, March 18th from noon to 4:00 pm. There will be demonstrations by some of the artists as well as an opportunity to visit with others. “The beauty of spring will be the focus of this show, with new works of the artists in oil, pastel, and sculpture of bronze and wood,” announced Judith Hale. Howard Carr is well known for his teaching, as well, but has set that aside to exclusively create his paintings. He loves to paint any subject, and his renderings are quick and loose, utilizing his skills at impressionistic scenes. 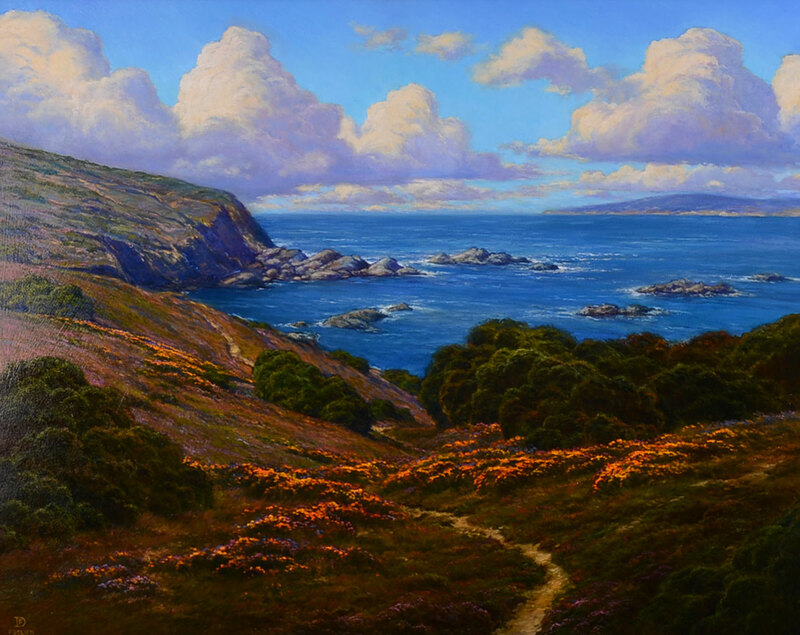 “Our new exhibit includes beach and coastal scenes, and a vivid flower shop,” said Hale. Dirk Foslien will be here for the opening on March 18th and will also participate with a demonstration. “Dirk, who is trained in the techniques of the Old Masters, is known for his oil paintings, especially of our local region and the flowering hillsides,” remarked Hale. “Many collectors own his beautiful works of oak trees and poppies.” Foslien also has broadened his visibility with figurative paintings, some from the basis of Old Masters works, as well as his own material. He is a favorite at Solvang Antiques, as he visits about once a month and spends the day painting in the gallery. “It is such a pleasure to watch a painting develop into a beautiful work of art,” commented Hale. Sculptor Angie Whitson, a Gold Medal winner in the California Art Club for her figurative works, will be in attendance as well. “Also joining us is Janeen Behl, known for her pastel paintings and bronze sculptor, Marty Goldstein, creator of a very humorous line of dogs. These and other artists look forward to meeting you at the opening,” added Hale. The show runs through May 31st.